Our technically knowledgable sales and engineering staff can understand and follow your specifications precisely or propose helpful modifications of alternatives--perhaps suggested by special consideration such as weight, charging speed or temperature. As an authorized value-added assembler working closely with the battery manufacturers, we have the special equipment it takes to deliver your work the way you want it, whether it be custom packs or single cells with your specified termination. Every single assembly is tested before delivery, not just some of them. StorTronics® 100 percent testing means 100 percent reliability. Orders and inquiries follow our standardized procedures. With our computerized internal tracking system, we can tell you the status of each project at all times. No shortages here. StorTronics® maintains ample stock on all common battery sources. Our "first in, first out" system assures constant new and fresh supplies. 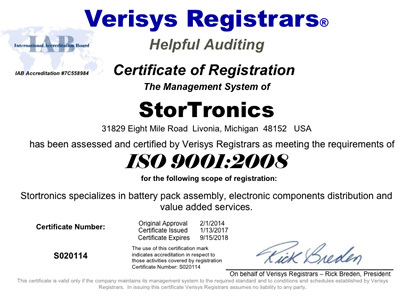 Finally, your batteries are cushioned and packaged by StorTronics® experts for safe arrival according to your schedule. You can count on any commitment we make.